28 Mar Mabeco Tours 2016 Expedition_Stage 2 – South of Mozambique. Only 6 hours of sleep after our night flight from Nampula to Maputo separated stage 1 from stage 2. On the early hours of the next day we started our South of Mozambique expedition. At 05.30 Am we were already at the road, driving towards our destination: Machampane Wilderness Camp in Limpopo Transfrontier Park. More than 9 hours driving took us there. There were good roads, bad roads and “so so” roads (nothing that we are not used to). The drive to this place is just beautiful. We passed along Macia, a place known for it colorful and lively fruits and vegetables markets; Chokwe, a city that used to be very famous as the “Cellar” of Mozambique because of its huge agriculture production fields and its modern irrigation system that produced a lot of rice; The Massingir dam, a significant water body that provides water for agriculture and consumption to all the area, specially during this years drought in the South and Center of the Country; and Limpopo and its conservation area. Because it is adjacent to Kruger Park and it forms a Transfrontier Reserve, the vegetation type is quite similar. It has less animal abundance but even so, the beauty of the area is very special also due to the fact that a river is just in front of the wooden chalets. As soon as we arrived to the Camp area we saw some fresh Lion tracks (possibly from the previous evening). This was a reminder that we were in a wild area and sometimes it doesn’t look like we see anything, but there is always something looking back at us. This was home for us and for the Guests. Our tracking Guide was very calm and also a real connoisseur of the area and its particulars: vegetation, wildlife and conservation. We did morning walks in the bush and we spotted plenty of Antelopes, birds and also some medicinal applications of some vegetation types of Limpopo. The place was very relaxing and we understood that this area of conservation is in the right track to become a potential next “hot spot” for game viewing and for the tourism Industry. Two excellent days were spent in Limpopo. Next destination was Inhambane province and its famous Tofo beach. We drove along the river Limpopo and we were able to learn that there is still a lot of agriculture and cattle breeding in the area. We have passed several villages that rely in this form of subsistence, observing the daily activities of farmers, shepherds and local populations. After we reach Tofo beach, the goal was again to rest from the long trip. But again, our energetic Guests weren’t very interested in that monotonous activity: resting. Immediately we organized activities for them, specially an Ocean Safari to observe the migration of the Humpback Whales. After some waiting period, the Whales decided to show up in splendor and in a rather short distance: less than 3 meters. 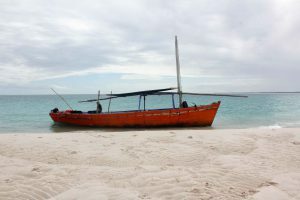 Tofo beach is known for being one of the biggest tourist attractions in Mozambique, but for sure it also is a very peaceful and relaxing place to be and get connected with Nature. The great seafood we can get there allowed our Chef, Venâncio to create very special and delicious meals, served in the wooden deck of the lodge we were in, overlooking the beautiful Tofo bay. Nobody wanted to leave Tofo, but we had to. We knew that we had plenty more adventures and beautiful places to see during the rest of our expedition. We drove North to Vilanculos. This is also one of the “must go” places when you are visiting Mozambique. It is conveniently situated very close to Bazaruto Archipelago, a lovely set of paradise type Islands. Once again we did a Dhow safari to Bazaruto. Sailaway Dhow Safaris made an excellent tour and we had a great experience. The Dhow was beautiful: a typical Swahili wood boat with triangular sails and a fire on board: this fire allowed the crew to prepare us fresh coffee at all times and also to cook the very tasty and unique seafood lunch, that would be served later on, in one of the most beautiful beaches of Bazaruto. Before lunch time we snorkeled in 2 mile reef, a place with so much life and colors. Yellow, blue, orange and red colored fish from all sizes and shapes can be seen in this reef. A really good experience for the ones that enjoy this type of activity. We climbed up and down, the massive sand dunes in the Bazaruto Island. Once we reached the top, we can contemplate the true extension of this massive Island and also its beauty. Sweet water lagoons are home from crocodiles and its dense vegetation is nest for hundreds of species of birds. After a long and tiring walk along the Island, our moral was great and so was our hunger: a great lunch was waiting for us. A true senses wake up call was the outcome of this experience. Vilanculos is a small city that in reality hides a lot of special places such as the market. This is a place that is enormous and most of the Tourists only explore the front side of it. Of course we went to the “background” of the market and again, we tried many new and different tastes and smells. We went to some beached that were located on the “outskirts” of the city and again, we had to pinch ourselves to confirm that we were not day dreaming: the stunning beaches of this area are just phenomenal. We were again in Maputo after a long day driving South. We had a few hours rest again in order to prepare ourselves for the next day. 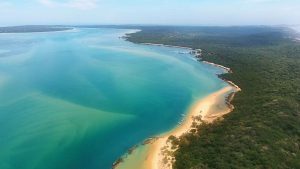 We would go to Inhaca Island, a piece of paradise that is located 1 hour away from the Capital city of Mozambique, Maputo. A powerful double engine boat took us there. In just 40 minutes we were in the Island, thanks to the great weather that we had that day. Wooden Cabanas would be our resting place and the meals, cooked by our Chef Venâncio, were based in seafood caught on the same day by local fisherman and also a good variety of wines (white and red). Long walks on the beach and amazing snorkeling on the coral reefs of the area were a daily activity. With the low tide, the thousands of starfish came up: “So many colors…so many starfish…Uau” – said one of our Guests. 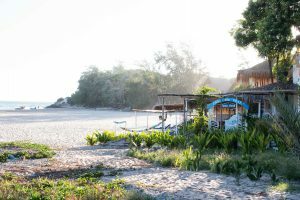 One of the mornings we went to Santa Maria by boat, where our vehicles were waiting for the group, in order to take them to one of Mabeco Tours Team preferred places: The Maputo Special Reserve (The Elephant Reserve). The sea salt was still on our skin, hair and clothes…and it would be until the end of the day. For 5 hours we drove along deep sand tracks that could well be the dream of any 4X4 lover. As we drove along this unique place, the Landscapes were just magnificent and out of this World. In this place, Savannah meets the Indian Ocean and the result is a unique place in the entire World. 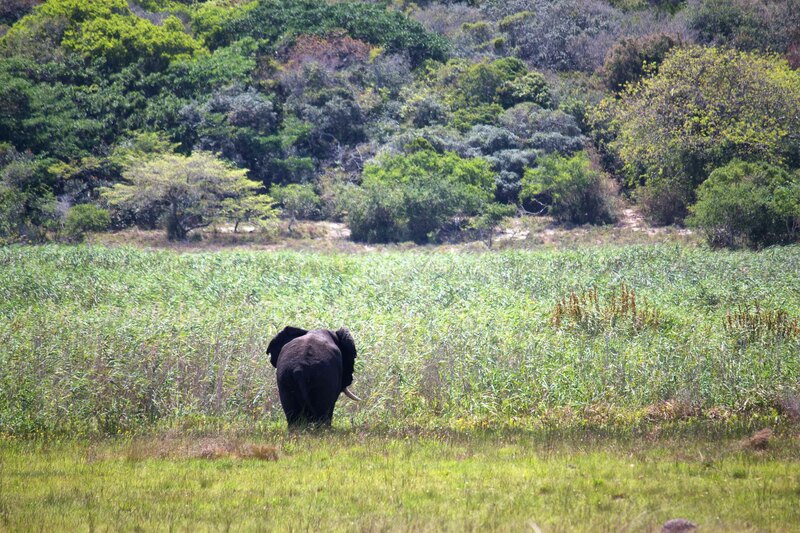 Maputo Special Reserve shares its area with Ponta do Ouro Partial Marine Reserve, so the best of two Worlds are merged. Several huge sweet water lagoons and dense forests separated by massive plains are a very special mix of environments that we can experience is the Reserve. One of the most least know places in Africa provides us good sightings of zebra, reedbuck, red duiker, common duiker, wildebeest, giraffes and Elephants. We reached our Camp area, where our staff started to assemble the semi-luxury camp straight away: we would provide to our Guests brand new tents equipped with beds and mattresses, private rest room and dinning area. 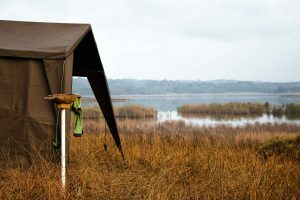 Our Guests just needed to enjoy the Camp, located in front of a beautiful lagoon with Hippos and many birds. After a sun down safari, we were able to observe the large “black rocks” (Elephants) of the Reserve, feasting among thousands of square meters of reeds. After a dry and long day, they would be on their way to the forest to spend the night. After a fantastic dinner we sat around a fire, telling stories of our experiences and also about the Maputo Special Reserve. We could not ignore the immense starry sky and its famous constellations. With all this “excuses” it was hard to go and sleep, but after a few good hours we eventually had to go. The mornings at the Reserve are ideal for photographs of the sunrise and all the show this event gives us. Our Chef prepared a complete breakfast with scrambled eggs, cold cuts and cheeses, warm bread, natural juices and fresh papaya with lemon. With such a complete meal we were ready to make our way back to Maputo. After a very pleasant drive along the Reserve we drove towards the Mozambican Capital city. After we arrived to Maputo we had enough time to rest for a bit and meet up later to have dinner in one of the best restaurants of Maputo. We were family and friends at this stage. It was a very beautiful moment that ended up the second stage of our excursion. Half of our Guests would depart the next morning towards Home. We had a great last day with the entire group: the friendship we built along time with these wonderful Human beings really made everything better and very special. It was hard to say Goodbye to all that needed to go back the next morning.